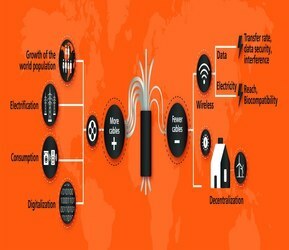 Looking at global megatrends, it is clear that cables will be still be used in many different applications, even far into the future, alongside wireless technology. The constant rise of the global population and the desire for prosperity – also in developing and third-world countries – demands for readily available electricity. Modern domestic appliances, particularly consumer devices and mobile phones, require a large amount of connections to work efficiently. Despite wireless being on the rise, cable will remain the technology of choice here (at least in the beginning) due to its efficiency, reliability and cost-effectiveness. There are still several limitations that make wireless technology counter-intuitive in industrial applications. Latency – the delay between an action triggered at location A and performance at location B – always plays a role in the wireless transmission of data. This becomes relevant when coupling sensors and actuators in a production process, where it often comes down to the millisecond, if not the microsecond. If data is not delivered on time, unwanted interruptions can occur or, worse, staff’s safety can be put at risk. The upcoming 5G standard promises 1ms latency but so far this has only been achieved in test phase. It is yet to be seen whether it will really be able to satisfy the industry’s high standards. Wireless technologies are seeing an annual growth rate of more than 30 per cent, but their market share of just six per cent is still very low. What is interesting, however, is the shift in the industry as a result. For example, industrial Ethernet has overtaken traditional fieldbuses in factory automation. Ethernet-based connections now have a market share of more than 50 per cent, which currently represents an annual increase of 22 per cent. The main drivers behind industrial Ethernet are the need for high performance, the integration of factory installations and IT/IoT systems and, in general, the Industrial Internet of Things.